The Friday NI Rocks Show on Rock Radio NI. Classic rock tracks, new releases, local rock and interviews. 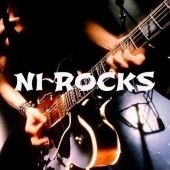 Find us at www.facebook.com/NIRocks or www.twitter.com/NIrelandRocks - To listen to a show just select it and hit play. Interview with KANE ROBERTS on the Show uploaded on 7th March and interview with CHAS WEST on the Show uploaded on 13th March. Check the INTERVIEWS tab for more info.